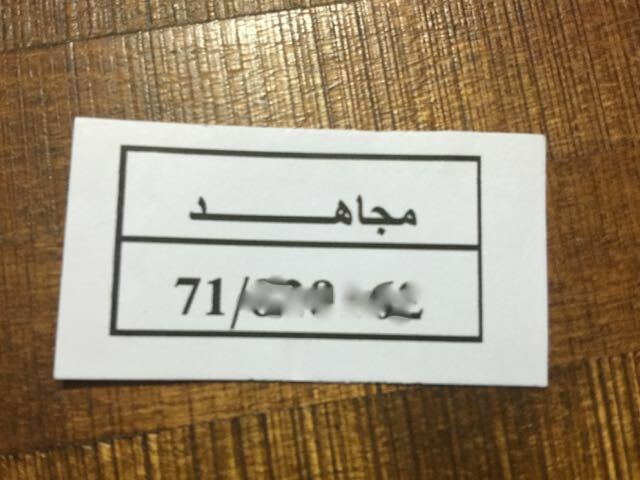 Home Tags Posts tagged with "South Beirut"
“I don’t mind sitting here,” I told the Hezbollah guard who kept watch over us in a run-down prefabricated portable office. “But I haven’t eaten all day and I’m hungry,” I added, not knowing it was already 10PM. “Tell me, what do you want to eat,” he asked. “Just tell me what do you feel like having,” the Hezbollah guard insisted. “How about shawarma,” I said, thinking of the famous south Beirut shawarma spot we were driving toward before getting pulled over and brought to this shack in an abandoned parking lot. “Beef or chicken,” the Hezbollah guard asked without blinking. We had been detained for nearly three hours and my hunger only added to the unease of not knowing what would happen to us next, if the guards were being honest or playing mind tricks on us or how panicked our parents and friends would be if they knew where we were. Our cell phones and IDs had been confiscated and all I could do was stare at the rusted bolt of the metal door that the guard kept shut as he watched us in silence–his black baseball cap turned low over his eyes. 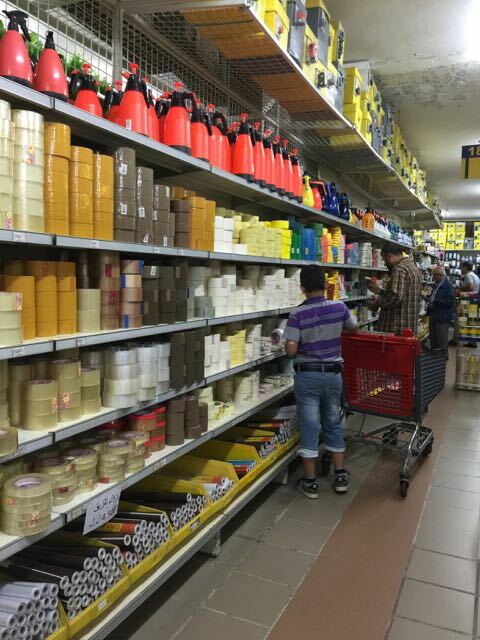 It all started early Friday evening after we had left Karout Grand Stores, a kind of Home Depot in South Beirut that sells everything from power tools to lawn chairs. We bought a tent for cheap for our camping trip to Nahr Ibrahim (Abraham’s River). But we couldn’t leave without having one of the best shawermas in the city at Harkous Chicken. It proved to be a fateful last stop. The last photo I took in South Beirut at Karout Grand Stores before being detained by Hezbollah. Often referred to as a “Hezbollah stronghold” in the Western media, south Beirut is really just a regular densely populated working class neighborhood where the party is popular. One difference is a large number of checkpoints and draw bridges that have been installed at intersections following the raft of car bombings that happened there in 2013 and 2014. It’s an understandable measure that has pretty much ended the violence but also leads to huge traffic jams. As we we were waiting to get through an intersection, I saw an interesting insignia on a concrete road barricade. Now what I found interesting was that Hezbollah also had established a reconstruction company after the end of the 2006 war, when Israeli bombs flattened an entire neighborhood and left some 20,000 people homeless. 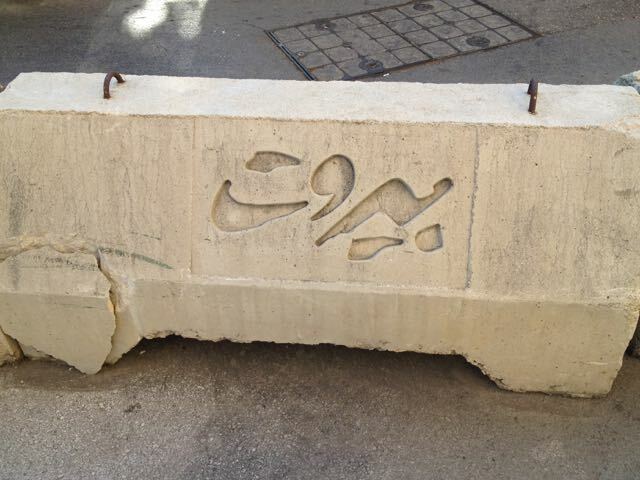 And in the rebuilding process, Hezbollah’s company “Wa’ad” (promise) also branded its logo on similar concrete barricades. A major difference is that Solidere, established by Lebanon’s late billionaire prime minister, turned old Beirut into a luxury playground catering to the rich, erasing much of the past social fabric of a mixed income city center, while Hezbollah’s Waad rebuilt the neighborhood for the working class families that lived there and encouraged them to move back. I thought a picture of the Waad and Solidere logos– in the form of concrete blocks– would make an interesting image for a further comparison. So I quickly snapped a picture of the barricade next to my car without even sticking the camera out the window. My passenger says he didn’t even see me take the photo, but someone else did. About a minute later as we finally got through the intersection, I heard a voice shout out, asking me to pull over. Immediately, a man approached: “Please step out of the car. Give me your license and registration. Give me your phone,” he said calmly. “I will erase the picture, no problem,” I offered, still holding on to my cell. We followed the scooter for just a few blocks and were told to stop and park near an abandoned lot. We waited in the car for a few minutes until summoned and asked to come out. As we walked up to the parking lot, a steely eyed man with a dark brown complexion and wrist tattoo greeted us coldly. He asked us to follow him to some old portable offices stacked up in the corner of the lot. My friend, who has mild anxiety was beginning to panic. “I’m not going inside,” he murmured as we followed him. But our minder led us straight into the little compound and pulled back a dirty old curtain to reveal what looked like a storage/junk room; it was dark with no lights. “Wait in here,” he ordered. “I don’t want to go in there,” my friend–we’ll call him T– said. The minder insisted that it was just procedure and left us. So we sat on the edge of the dark room, refusing to go inside. T popped an anti-anxiety pill, as a precaution if things got worse. Suddenly I felt horrible for taking the picture. -Where are you from — i.e. my father’s village. I said I don’t belong to a political party and that I was a critic of the political system and that I thought all Lebanese politicians worked together. I told him how I cover real estate development and why I was interested in the sign. I told him I have criticized Solidere so much that people think I am pro-Hezbollah. (The late prime minister’s party and Hezbollah are political rivals.) I told him I write about internet and ancient ruins, also. He listened patiently. He asked when I had come to Lebanon, since earlier I said I had lived abroad. “Do you want me to tell you my life story,” I said sincerely. I looked at T who was waiting outside and he rolled his eyes. Haj 1 asked what other countries I had traveled to. “All of them,” I asked, jokingly. He didn’t flinch. I said many countries in Europe, like Italy. Hajj 1 was flanked by the stern-faced young guy that let us in. We’ll call him Hajj 2. Both stared at me quietly and intently as I spoke. I kept talking, trying to convince them I was innocent. I even remembered the names of some Al Manar (Hezbollah TV) staff I had met before. I even once applied for a permit at Hezbollah’s media office when working on a documentary for Danish TV about the destruction of the 2006 war. “All my information is already with Hezbollah, I said. Hajj 1 smiled at Hajj 2 and then a third man showed up, also wearing jeans and an embroidered button shirt. We’ll call him Hajj 3. He greeted Hajj 1 with a kiss and a handshake and I thought he was just a guy passing by off the street to say hi. But Hajj 3 turned out to be a more significant player. Hajj 3 asked my friend and I to follow him. Without warning, he whipped out a small digital camera and told me to stand against the wall. I smiled and then I was serious. This was not a driver’s license photo. He brought the camera about 5 inches from my face. I later learned he had just done the same with T, having interrogated him in another room. Hajj 3 then led the two of us into another portable office. To the right there was a small barracks with two army cots stacked up like a bunk bed. Hajj led us into a third room the size of a large closet with two chairs and a desk. He closed a rusted metal door behind us as I saw a man entering the barracks with a Kalashnikov rifle slung around his shoulder. He was not wearing a uniform either. Hajj 3 shut the door and sat behind the desk. T and I looked at each other. Things seemed to be going well but now we were confined to a drab claustrophobic space behind a metal door. Hajj 3 didn’t talk to us much. He sat behind the desk and appeared to be writing notes. I tried explaining my story again, but Hajj 3 kept his baseball cap over his eyes, and the high desk blocked his face from me. He nodded. Could we call our friends and family? Hajj 3 said, “I will talk to the Hajj”–meaning Hajj 1. “It should only be a few more minutes.” Finally Hajj 1 popped in the door. He asked T some questions and then left again, assuring us it would be a few minutes. Another hour passed by. I laughed and said, come on, “it’s known.” Hajj 3 cracked a half smile. “Really, guys I can’t tell you anything.” I kept talking. I told him about my investigations about telecom and ancient ruins being cleared, how the coast was literally being sold off to private companies. At some points he looked up and seemed to be curious. T said, come on, this guy has other things to worry about than corruption scandals. Hajj 3 cracked a smile briefly. So T kept asking him. This time I rolled my eyes at T. Hajj shook his head and half smiled. But T kept going. “I mean, how does someone even apply for work with you?” I laughed. Hajj 3 got up. It seemed we were driving him nuts. “I’m sorry are we bothering you,” I asked. “No not at all,–Walou” Hajj 3 said as he stood up and opened the door. I joked that he was going to go home tonight and tell his family that some guys they detained asked him all these questions. He cracked a smile again, only briefly, turning away to hide his expression. I hoped we would get home to tell the story too, but as time passed by, I grew increasingly unsure about that. It had now been over two hours. Earlier Hajj 3 repeatedly said it would only be a few minutes. Our friends had been waiting for us at the chicken restaurant. Hajj 3 sat back down behind the desk. “It’s taking a long time, ” he said. That didn’t sound good. I couldn’t think straight. I literally had eaten all day. I had back to back meetings then I had to pick up T from the airport. All this happened during his first few hours in Lebanon. I pleaded again to Hajj 3. He offered the food again. I told him I want Harkous chicken, he smiled and said: “What if I get you chicken and write Harkous on the receipt?” He smiled. “What about chips? Pepsi? Hajj 3 had already offered us water and cigarettes. I felt confused. One minute everyone was nice and wanted to help–the next minute there were long silences and no food ever arrived. Was this a psychological game? Where will they take us next? Finally after nearly three hours, Hajj 1 showed up again with our IDs and phones in hand. He gave me a piece of paper and asked me to write down the website where I would write the article about comparing Wa’ad with Solidere. Now he was smiling. He then asked me to write down any other papers or media I work for. He handed our phones back and asked me to unlock mine to delete the pictures of the barricade. I protested but he insisted and I think T was about to kill me. I obliged and Hajj said I could apply to the Hezbollah media office to get that picture. Before we left, and now that I had my phone back, I wanted to show Hajj 1 a video a local TV station produced about a blog post I wrote that forced the New York Times to correct an article misquoting Hezbollah leader Nasrallah. As we walked out into the parking lot, I tried to open the video several times in vain. “You are trying to open a video,” Hajj 1 said with a chuckle. “God help you! The coverage is terrible here. You’ll wait an hour to load it. Once again, notoriously slow Lebanese internet would haunt me. We shook all their hands and got back into the car. Looking back at the experience, I have to say Hezbollah treated me far better than the corporate real estate developers that twisted my arms behind my back until I erased pictures of ancient ruins I saw on their site or the masked young hoodlums that belong to a Western-allied political movement who ran after me. Or the Lebanese government official who ripped away my voice recorder after our interview, erased all my audio files and threatened me in numerous ways. Yet in the South Beirut “Hezbollah stronghold”, never once did anyone shout or curse at us, threaten us with weapons or any sort of physical violence. But it still wasn’t fun. Having your phone and personal data confiscated against your will is invasive and unnerving to say the very least. I’m also not sure it was the best use of my time or Hezbollah’s time to stop anyone who takes a photograph. On the other hand, with so many car bombs and regular threats of war from Israel, it’s not hard to understand why they might be a little bit paranoid. Was my experience unique? A couple of weeks ago, a woman taking a photo in south Beirut claimed to have had it much rougher. She said the Hezbollah men had threatened and shouted at her, even put a gun to her head. At first I was horrified by the piece, but now I wonder if perhaps there was more to the story. Did she challenge the security men more than I had or more than she told the news channel, which convienently is staunchly anti-Hezbollah? Was I treated better because I was a journalist? One journalist working for a major Western news organization claims to have been beaten and tortured by Hezbollah. I can’t be sure why these accounts differ so greatly from mine. But amid all the wars Hezbollah is involved in, both T and I emerged with a sense of appreciation that things didn’t go worse. 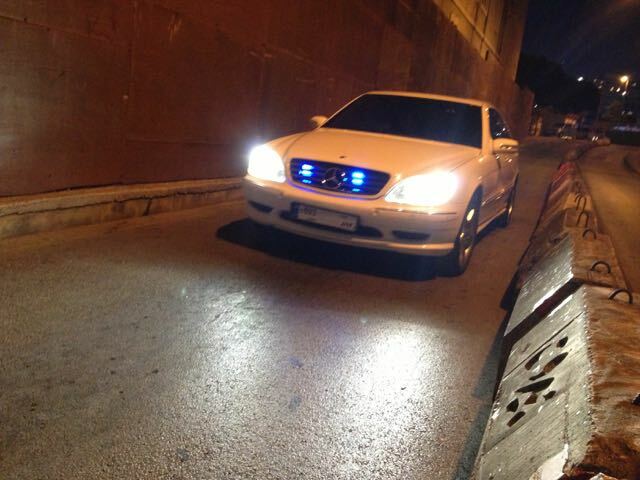 Moral of the story: Don’t take pictures in South Beirut. Is that good for journalism and transparency? Definitely not. But these are not ordinary times either.